I find this a very satisfying way to make use of the fresh corn available at the farmers’ market or if you’re lucky your own back yard during the summertime. 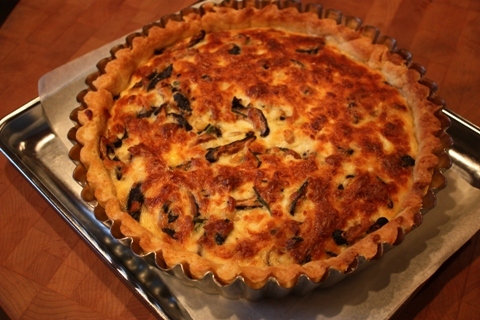 The cornmeal in the crust adds a bit of crunch and the herbs in the quiche complement the flavours of the Shitakes and corn. In the bowl of a food processor, pulse the flour, corn meal, salt and sugar together until combined. Add the butter and pulse until the mixture resembles coarse sand. Turn the machine to full “on” and add the iced water in a slow steady stream, adding only enough to make the dough come together. Process as little as possible. Place a two large squares of plastic wrap on your counter. Turn 1/2 of the dough out onto each. Using the plastic wrap form each into a disk and place in the fridge for an hour. You will need only one of the disks for this recipe. Freeze the other half or use for another purpose. A nice fresh fruit gallete maybe? 2-1/2 cups fresh corn kernels- or can use frozen just thaw and drain well- do not use canned! 1/2 recipe of cornmeal pie dough (Corn meal pate brisee) recipe from above, rolled out and placed into a round 9″tart pan with a removable bottom and 2″ sides- or a similar type pan. Chill in the pan before prebaking below. Preheat the oven to 375F. Place a piece of parchment into the chilled, dough lined tart pan, place beans, rice or ceramic pie weights into the parchment. Bake for about 30 minutes and then remove the parchment and weights. Return to the oven and bake for about 15 minutes more until golden. Remove and cool on a rack while preparing the filling. Heat a large saute pan over medium high heat for a minute and when the pan is hot add a little olive oil to coat the bottom. Add the mushrooms and cook for a few minutes until they begin to release their liquid. Add the onion, green onion, and half of the chives. Cook until the onions are soft and translucent. Add the corn and cook a couple of minutes. Remove from the heat. Set aside while you mix the half and half and eggs together. Beat them well to combine and season with a bit of salt and pepper and a pinch of chile powder. 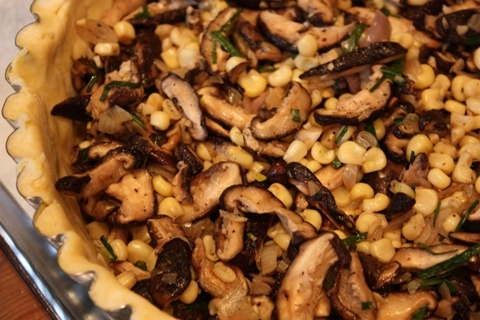 Stir the remaining chives and tarragon into the cooled mushroom corn mixture. Layer into the prebaked pie shell alternating with 2/3 of the cheeses. Pour the egg and half and mixture over it all and top with the last bit of cheese. Place the pan on a baking sheet lined with parchment or foil to catch any overflow and bake in the center of the 375F oven for 35-40 minutes , turning it round at midway through baking to ensure it cooks evenly. Watch the crust for overbrowning and cover with a circle cut out of foil to just cover the crust edges if necessary. Stick a knife edge into the center to make sure the custard is set before removing from the oven. This is really important because the cheese will set and become golden on top before the eggy custard will have cooked through. Remove to a wire rack in the pan and cool slightly before serving. Makes about eight generous servings. The final golden yummy quiche! This entry was posted in Breakfast, Herbs/Spices/Condiments, Main Dishes, Pie, Recipes, tea treats, Vegetarian and tagged Cornmeal Pie Crust, Fresh Corn, Pate Brisee, Quiche, Shitake Mushrooms. I am a writer, artist, gardener, obsessed cook/baker and recipe lover. I spend my time finding new ways to enjoy my life and try to encourage everyone around me to do the same. I like creating a cozy, warm, comforting and inviting atmosphere and hope to share some of that here. Hopefully, I get to learn from others who share my interests too. I LOVE this recipe! My husband and I have had it several times. I’m a bit of a foodie, but my life (and eating style) has changed monumentally since my twins were born. We have been eating a lot of quiche lately. With the girls I can prepare it when they are napping, and then throw it in the oven while I’m feeding them/getting them ready for bed. 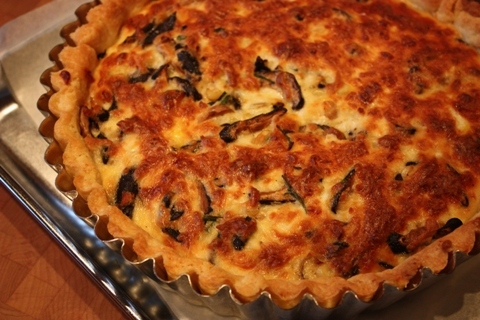 Then my husband and I can relax with the quiche, a light salad and some wine. Thanks for sharing this great recipe! You’ve got a great combination of flavors in that quiche. I adore shiitake mushrooms and they would be delicious with the tarragon! That looks fantastic. Good thing it makes 8 GENEROUS helpings because I bet no one can limit themselves to a thin slice. This looks perfect! Love the browned top. I never had this kind of quiche before! sounds delicious with some green salad!! I love a good quiche. Yours looks perfect! Visit Gabi's profile on Pinterest. Thanks to Holly at Phemomenon! Thanks to Hilda at Dhanggit's Kitchen!